December 27, 2017, 12:53 PM · I never can predict when the music of the season is going to bring me to a state of misty-eyed gratitude for all of life -- or when it's going to make me roll my eyes and rage like the Grinch. This current season has certainly brought about both situations -- from the first hokey Christmas tune blaring at drug store in November ("NOVEMBER!" I raged) to the soul-melting beauty of the vocal quartet at my church singing Holst's "In the Bleak Mid-Winter" on the morning of Christmas Eve. Another unexpected moment came when I was listening to Lindsey Stirling's holiday album Warmer in Winter, in honor of one of my youngest students, age six, who adores Lindsey. I Grinch-ishly expected a pretty straightforward Christmas album, so when her rendition of Jingle Bell Rock took a surprise Big-Band turn (at 1:35) I have to say that I laughed with delight! I mean, Sing Sing Sing Lindsey -- it's truly a nice arrangement. Some of my favorite musical moments so far this year had nothing to do with the music at hand, but more to do with the way I could see music bringing together a community. My musical activities of the season were kind of bookended by two Handel "Messiah" performances - one at the beginning of December that brought together 189 singers from 108 congregations of all kinds; then the smaller Boxing Day Messiah that I play every year at the home of violinist, violin-maker and collector Dr. William Sloan. In the first case, singers had been gathering annually for the Messiah for 50 years; and in the case of Dr. Sloan, it's been nearly 20 years. What powerful traditions! 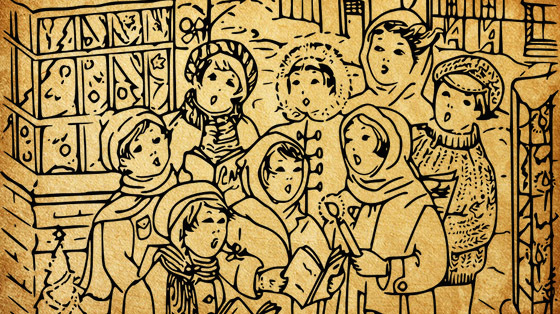 What are your holiday musical traditions? Did you have any surprise moments of sublime beauty this year? Any moments of sheer Grinch-like holiday-music anger and rage? Please feel free to share in the comments below. And we wish you a happy holiday season! Hallelujah, Let's Play the 'Messiah'! December 27, 2017 at 08:09 PM · I love, and can listen for extended periods any classic Christmas carols. But when they roll out Bruce Springsteen’s “Santa Claus is Comin’ to Town”, or any other modern abomination. Forgettaboutit. Interestingly, I was in Japan mid December, and I’ve never heard so much public Christmas music playing all over the place! Hotels, department stores, out on the sidewalks outside of the stores...all over the place, it was full on “Merry Christmas!”, no political correctness holding it back. They don’t even get Christmas Day off as a holiday, but decorations are up and the music is playing. Nice. December 27, 2017 at 10:26 PM · This holiday season has been tough for me. I injured myself (and can’t play my violin, among other things), went through a seemingly endless succession of bouts of flu, was knocked low by a personal tragedy, and struggled through SAD. My saving grace, as always, has been music. Through many long, sleepless nights, I have listened to music. I set my iPhone, which I keep on my night table, to play long recordings of Xmas music. My favorite is Bach’s Christmas Oratorio, which is over two hours long and is performed by several excellent musical groups. I also enjoyed other Christmas related music which I generally listen to only at this time of year, including several compilations of carols sung by the King’s College Choir, A Festival of Nine Lessons and Carols, and The Vienna Boys’ Choir Christmas Carols. Music truly brings light into darkness. December 27, 2017 at 10:55 PM · I usually have some orchestra concerts, a church performance, and student recitals. December 28, 2017 at 01:52 AM · Ugh! I’m the happiest when the season is over. It’s totally overdone and inescapable (they start putting up the red/green plastic stuff earlier and earlier every year, just programming everyone to spend). Plus I have to teach some of it to the “yoots” — it gets so old after 22 years on the barricades! Happy Winter Solstice, everyone! December 28, 2017 at 02:05 AM · I love hearing the music -- especially the songs that mention Jesus, "the reason for the season" -- although, from what I've read, Jesus was likely born in spring. BBN radio plays these songs every year, December 1-31. I run playlists of them on YouTube also -- still going strong. The music I don't care for is the collection of trivial songs about Santa, reindeer -- you know -- just about everything except the real reason for the season. I don't loathe hearing some of these songs -- they do bring back some fond memories of early grade school days. But some of the lyrics, although they don't make a Grinch out of me, can just about make me gag now; so, please, don't ask me to join in singing them anymore. Messiah is one of those works I don't tire of hearing. Quite a few of us already know, I'm sure; but for those who don't, the work was commissioned originally for Easter. It premiered April 13, 1742, in Dublin, Ireland, one of my ancestral towns. December 28, 2017 at 06:37 PM · I second you on hearing Xmas music on the first of November! Argh. A yearly tradition includes having the children sing and do a performance for their gifts, when all the immediate family gets together. A nearby college always performs Christmas Festival concerts each year by their Music dept. known for their choir. Sublime! Nothing strikes me like the human voice. December 28, 2017 at 09:05 PM · My fave musical moment came this year when I was out walking in my neighborhood looking at lights". On came the headphones, with "A Winter's Solstice II playing. I came upon my favorite house. You can't see it from space, but it is designed to perfection with lights. A light covering of snow, and even a "fairy mist" at the base of the main tree in the front yard, it is magical. Fred Simon's "Simple Psalm" playing as soundtrack. Merry Christmas!! January 1, 2018 at 10:26 PM · I can tune-out a lot of Christmas music. Sitting in Starbucks I often note that "I heard that song when it was new." Yeah, I'm that old. Nobody addressed playing Christmas music. I have an annual ritual starting with the first Sunday of Advent I play through the Episcopal Hymnal for the appropriate seasons of Advent, Christmas and Epiphany. But, when Lent comes along, with its dirges, I close the Hymnal and go back to my regular music. January 2, 2018 at 05:23 PM · Christmas music brings warm memories from my childhood. I always liked them. This year, enjoying Christmas with relatives at my sister's home, for the first time I took my violin with me and played some of the so loved tunes. It was a great moment. January 2, 2018 at 07:55 PM · Having played, heard and written some ..er...Holiday tunes, each year I listen to the following (several times) and have won some converts attesting that this is perhaps the most arresting and emotional offering. January 2, 2018 at 10:16 PM · That is some beautiful music from Jessye Norman!